A large contractor out of the Albany area is currently working on a project in which they must run new piping through several floors of a manufacturing plant. To do this, they had to first determine the location of the reinforcing steel located in the deck so they could avoid cutting through it. 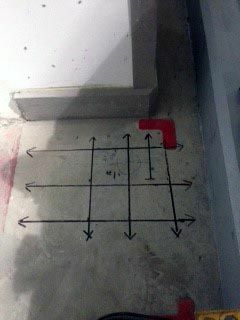 The only way to complete this task without cutting out the concrete was to hire someone who could see into the concrete! They were referred to Ground Penetrating Radar Systems, LLC., who is the largest company of its kind in the country. They had heard GPRS had the ability to determine spacing, and depth of reinforcing steel, as well as determine the difference between rebar and post tension cables. For these reasons they decided to hire GPRS to complete the scanning. Jim Bell of the Upstate, New York office, which focuses on the Buffalo, Rochester, Syracuse, Corning/Elmira, Binghamton, and Albany markets mobilized to the site and was able to quickly detect and lay out the steel running through the parking structures’ concrete deck. Jim and GPR were able to complete this project in real time and with none of the radiation concerns that come with using x-ray to locate tensioned cables or rebar. Ground Penetrating Radar Systems can also be used to locate and map out rebar, post-tension, and conduit prior to saw cutting, trenching and drilling into concrete. If you are interested in obtaining more information or a quote please contact Jim Bell at (518)390-3725 or jim.bell@gprsinc.com.